We’re having spring (see below). Some of you (rumor has it) are still enjoying winter. This is a great stew for the end of winter and a classic for St. Patrick’s Day – in the U.S.
We lived in Ireland for a year and St. Patrick’s Day was celebrated by going to church, if at all. There were no parades or parties or rivers of green beer. I’m told that in more recent years the Irish in Ireland are celebrating the day in much the same way as the Irish in the U.S. Somehow, I think they enjoy their Guinness without the addition of green dye. But they are willing to put a bit in the stew. 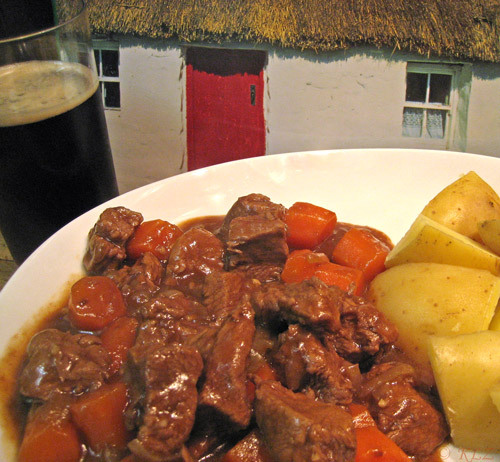 Slow braising makes this beef very tender and the beer adds a robust flavor. 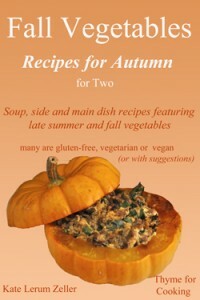 Serve with ‘Jacket Potatoes’: potatoes baked in their skin and a staple in Ireland…. And a pint of Guinness on the side. This serve 4. Cut beef into 1″ (2.5 cm) cubes. Cut carrots in half the long way, then into 1″ (2.5cm) pieces. If you would like the sauce thicker, dissolve 1 tbs cornstarch in 2 tbs water and stir in as much as you need – a little at a time, cooking and checking, or it will get too thick. I was, of course, sitting at my computer, totally engrossed in something, listening to the radio and ignoring the world. How could I have not heard that! 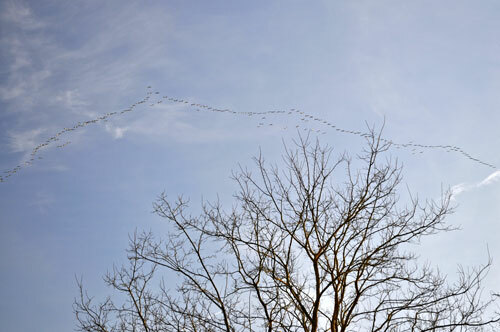 The ‘grue’ (cranes) were migrating. One can hear them for miles. And when there are hundreds migrating, as they seem to do, it can get very loud. They fly in a V, like geese. Looking up it was as if waves of birds were flowing overhead, all chattering to each other. Huge V’s, taking up the width of the sky, one after the other flew over. 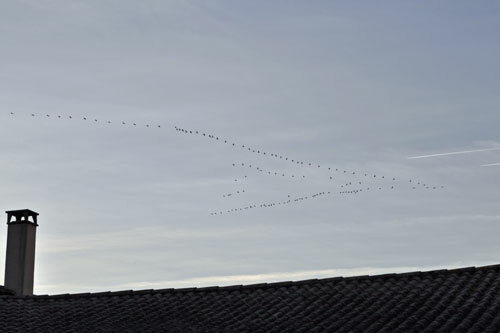 It was fascinating to watch: The birds at the ends of the V barely flapped their wings, once every few seconds if at all. The birds in the lead flapped constantly for a few minutes, then a group from the middle moved forward to take the lead and the ones in front dropped back. It would look chaotic for a few seconds, then the V would form, hold for a few minutes, then shift again. We watched for about 10 minutes. 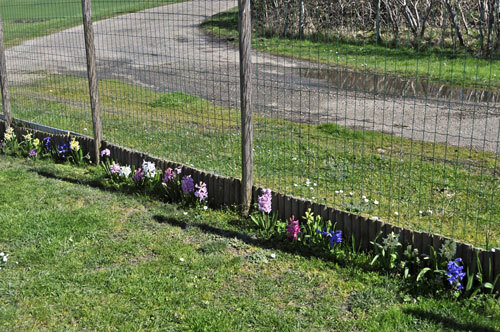 Another sign of spring – my hyacinths are starting to bloom. The dogs have managed to patrol the fence line with out trampling them. On the road you can see the last of our mini-flood. It hasn’t rained for over a week, but the ground is so saturated, that the water has flown down the hill and collected at this spot on the road. Up until yesterday, the water went over the road and into our front lawn and driveway. Once I saw it was finally stopping I took the scissors to both dogs, cutting off all the dried, mud-caked fur on their bellies, legs and paws. Then they rolled about on the grass a bit. It is hot here, humid too but I am not in a rush for it to end !!! Well now I really am jealous. They’ve changed the forecast to 6 to 8 inches with up to 2 inches an hour tomorrow morning! I need to find someplace warm to live. My calla lilies are in full bloom and my flowering crab is covered in flowers and bees. Definitely spring. I’m going to try your stew for St. Paddy’s Day this year. Nice change from corned beef. Beautiful post….how lucky for you to have witnessed the migration. At least it’s a sign of good times ahead, even though tomorrow winter is going to remind us, not so fast…. Zoomie, the flowers of spring always smell so wonderful, don’t they?